Nothing like a sore body to keep me planted on the sofa in front of the telly, laptop available without much physical work. As mentioned earlier, I’ve been good about making a summit hike a year, at least. This is my second of the year. Yet, all that said, I made the biggest goof of all. I woke up, at the B&B and found, with that dreadful sinking feeling in the pit of my belly, I forgot my hiking shoes. I didn’t even have trainers. So I wasted a whole day driving back home to get the shoes and hiking pants that I also realized I forgot, and back to Wales. 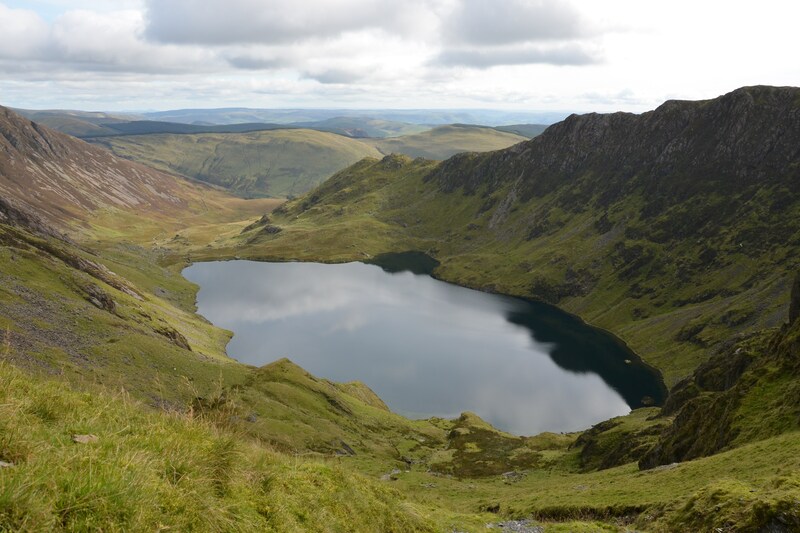 I can see why Cadair Idris is one of the most popular hikes in Wales. Take a look at the beautiful sights. The ridgeline rose above and circled a lake tucked in the valley. A lot of literature about glaciers and whatnot. To me, it was just stunning to see the wall of cliffs create a semi-circle around the water. Despite all my reading, I somehow managed to go a different route. Probably because I got distracted. 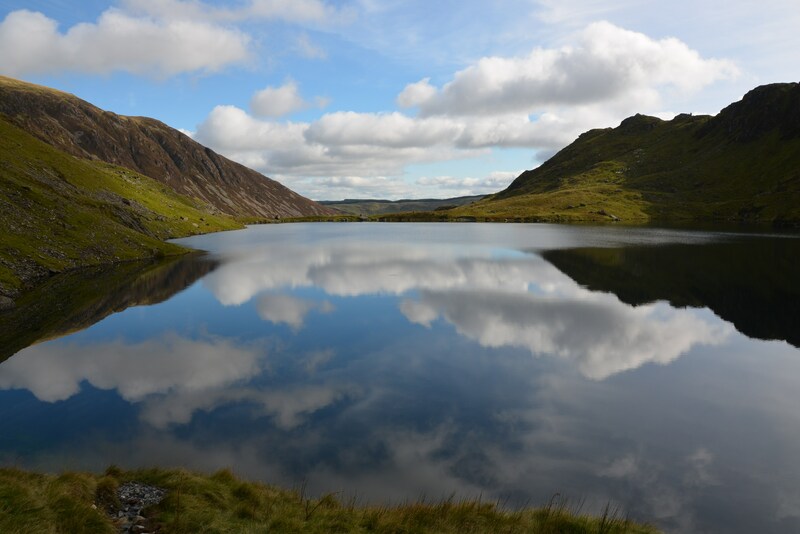 I ended up coming up to the lake, Llyn Cau, from the shallow end. When the path should have veered left and up to circle the ridge clockwise, I ended up watching a team of shepherds and their sheepdogs steering their grazing herd from the inner crater area to the outer rim. I found myself following another path around the lake, until I was just at the base of the wall leading to one of the lower peaks, Craig Cau. I don’t think I realized how steep the climb up was until half way, when I thought to myself how my little scrambling experience was being put to good use. And that I should have put my camera in the bag instead of slung across my body but that it was too steep for me to stop and sit to adjust that. To give you an idea, in that length, I went .4 miles in distance, and gained 703 ft in altitude. I would not have traded that climb for anything. I love a good challenge. Not recommended for the faint of heart or those with no hiking nor climbing experience, but otherwise manageable. The hiking down to the summit of Mynydd Moel was rather uneventful, a large grassy route that made me actually bust out into the tunes of “The Sound of Music.” After the nth iteration of “Doe, a deer, a female deer; ray, a drop of golden sunnnn; me, a name I call myself.. ” Has anyone ever realized how that song can get stuck on an endless loop?? “And that brings us back to Doe. Doe, a deer.. ” Good thing I was the only walker for a long stretch. How well does sound travel cross those ridges, do you think? The descent is absolutely horrific, a loose and extremely steep death trap of boulders of all sizes and shapes. I found myself resolving to purchase a pair of walking poles. For others, I recommend taking the climb I made from the lake, then walking the counter clockwise route after reaching the summit. The view is to be much more stunning and the experience more enjoyable. Your legs will thank you… as mine are cursing me today.